The Indiana War Memorial is one of the crown jewels of Indianapolis, but much like the soldiers it stands for, it came at a heavy cost–in this case, to the city’s history and architecture. Some extraordinary buildings were demolished to create an unencumbered view of the block upon which it stands, and the adjoining Legion mall blocks immediately north. Among them, on Vermont Street alone, losses included the Second Presbyterian Church, Indiana Democratic Club, and the First Baptist Church. In many early articles about the development, those two churches were supposed to be allowed to stay, and they did remain longer than others, but as with the rest, eventually were demolished. A few other noteworthy demolitions included the Blind Institute, The Chalfant, The Cambridge, and the original Propylaeum, and so many others. One that was saved–at least for a time–was the five-story Bobbs-Merrill building, moved from 18 East Vermont to 122 East Michigan, replacing an historic home demolished for the use. Coincidentally, the historic home at 122 East Michigan was the second historic home demolished to make way for that Bobbs-Merrill building, itself doomed to be demolished after all that, in 1971. It’s amazing to think that Indianapolis is nearing its 200th birthday, and has so many instances of ‘build, demolish, rebuild’ on individual properties–especially downtown. Let’s look at the evolution of 18 East Vermont Street where Bobbs-Merrill built their new company headquarters in 1910. The earliest property map from 1866, below, shows only two dwellings in the southwest quarter of Square 16. Both of those properties were owned by members of the Mansur family. We will look at the other half of the property in Part II. Sometime between 1866 and 1883, the property at 18 East Vermont was further divided, creating a third property on its eastern border. The home of Willis C. Vajen at the newly added, 22 East Vermont first appears in the 1883 city directory. The date of the house featured at the top of this article is unknown, but clearly, that also changed between 1866 and 1887, as you can see by comparing the outlines of the dwellings on the same property in the two following maps. 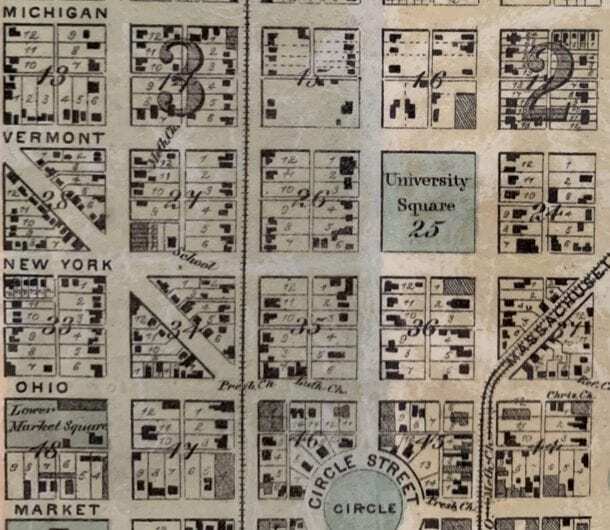 1866 map, showing square 16 with two homes on the southwest part of that square fronting University Square. Eventually those two homes were numbers 10 and 18 East Vermont Street. Based on city directory research, members of the Mansur family occupied the home at 18 East Vermont from 1857. 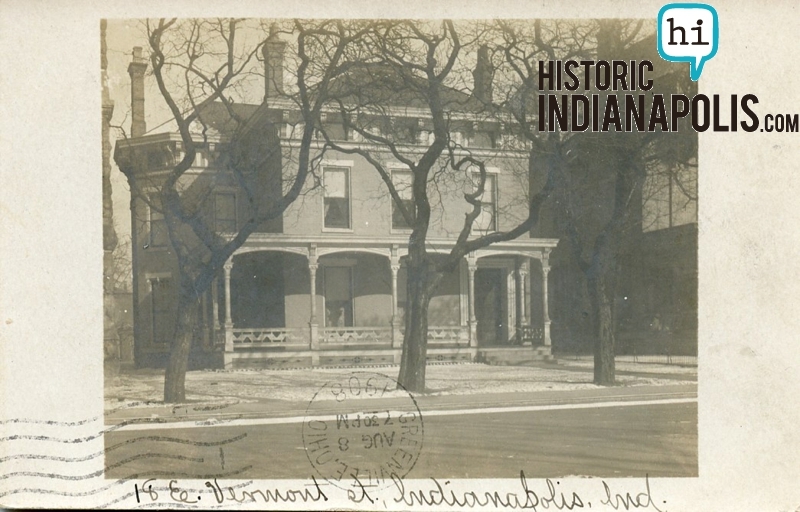 Jeremy Mansur was the father of the Mansur clan who moved to Indianapolis from Richmond; his widow, Jane, continued living at 18 East Vermont after his death in 1875. She appears to have lived there til her death in September 1881. A smattering of others resided at the address for the years following Mrs. Mansur, but by 1887, John T. Lecklider acquired the home at 18 East Vermont. 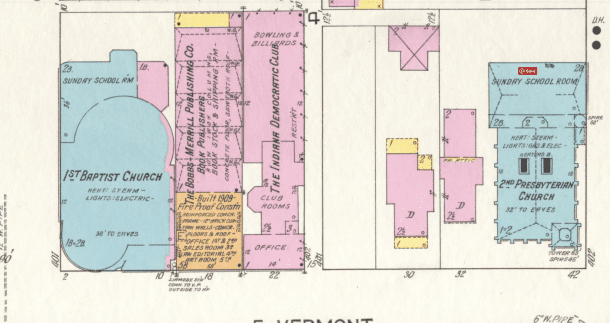 1887 Sanborn map, before the First Baptist Church was built on the northeast corner of Vermont and Meridian streets. 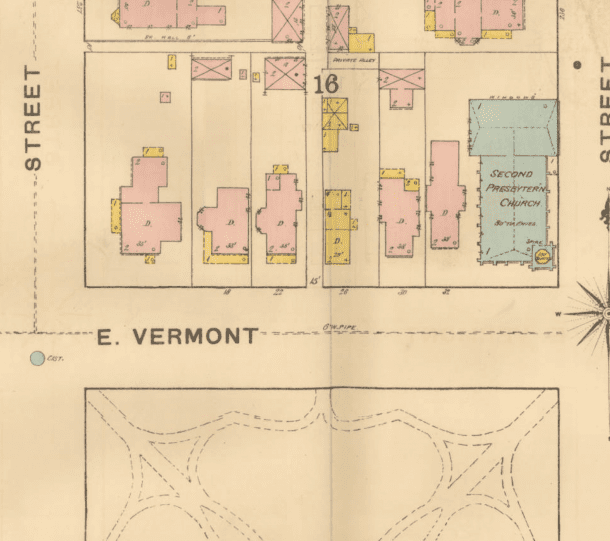 As with most of the greater downtown streets in the early years, the block of Vermont between Meridian and Pennsylvania streets started as primarily residential, as evidenced by the 1887 Sanborn map above, with the exception of the Second Presbyterian Church on the northwest corner of Vermont and Pennsylvania streets. 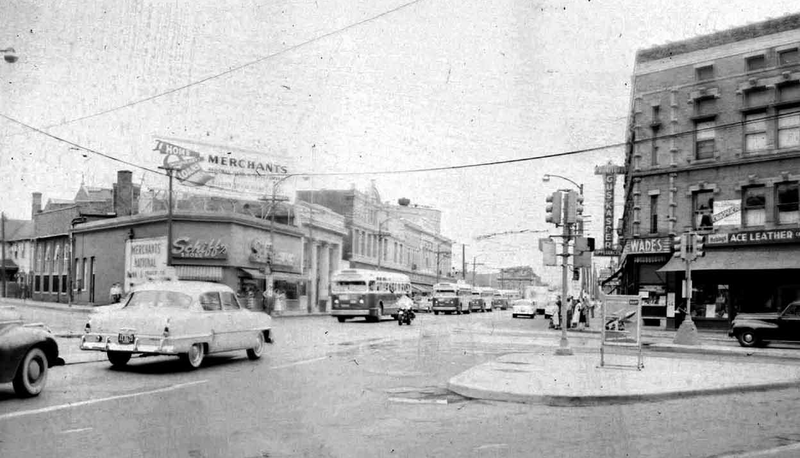 But downtown was continuing to evolve and commercial interests continued to expand beyond their origination point in Washington Street. Ohio native Lecklider was an attorney who lived at this address from 1887 until he sold the property to Bobbs-Merrill for $45,000 in 1910. 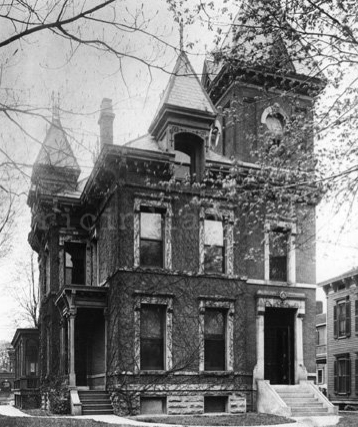 He and his first wife, Adelaide moved to Indianapolis in 1875 and lived at 196 North Delaware for most of the years preceding their stint on Vermont Street. The first Mrs. Lecklider died in the summer of 1899. Four years later John T. married his second wife, Mrs. Adelaide (Ada) Thomas. It is this Mrs. Lecklider who sent a post card to John’s brother, Frank Lecklider, in Greenville, Ohio, featuring the house at 18 E. Vermont Street in August 1908, as seen at the top of this post. 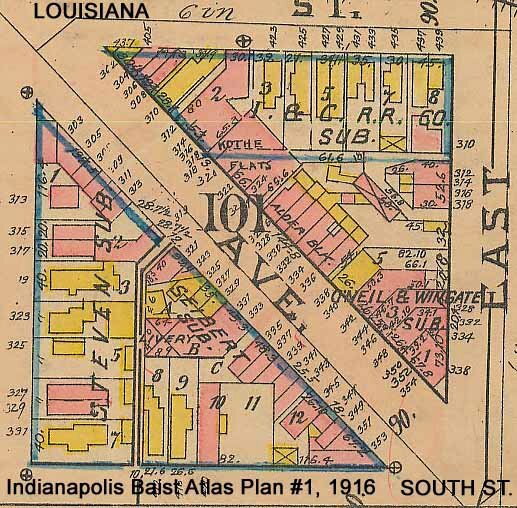 After selling the property, John T. merely moved across Meridian street to The Blacherne. 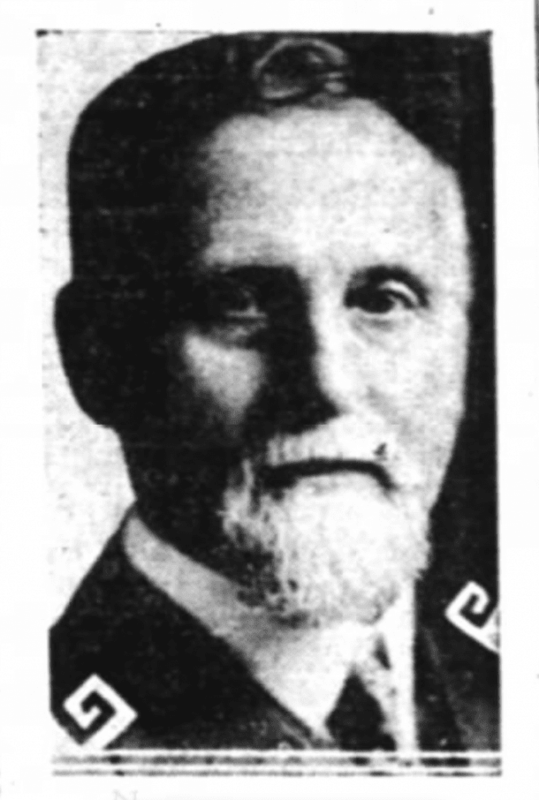 His obituary noted that he lived in Apartment 62 when he died in January 1929. His second wife preceded him in death in the spring of 1923. All three are buried at Crown Hill Cemetery. 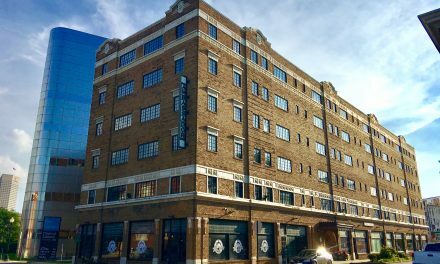 After Lecklider relinquished his home in 1910, the Bobbs-Merrill Company announced that its new building would consume all of the 53-foot frontage of the property and 195 feet of the total 207 feet of the available depth. Layout and designation of space included unbound sheets of various publications to be housed in the basement and under the sidewalk, a “plate vault” to hold all the electrotype and stereotype plates from which books were printed. Sales, shipping, and some miscellaneous publications would be on the first floor; general offices and counting room on the second floor; and the editorial, art, legal and library departments on the upper floors. The Hollenbeck Press, acquired by Bobbs-Merrill soon after the turn of the century, was still located on the northwest corner of Market and New Jersey Streets, where it remained so for a few decades. 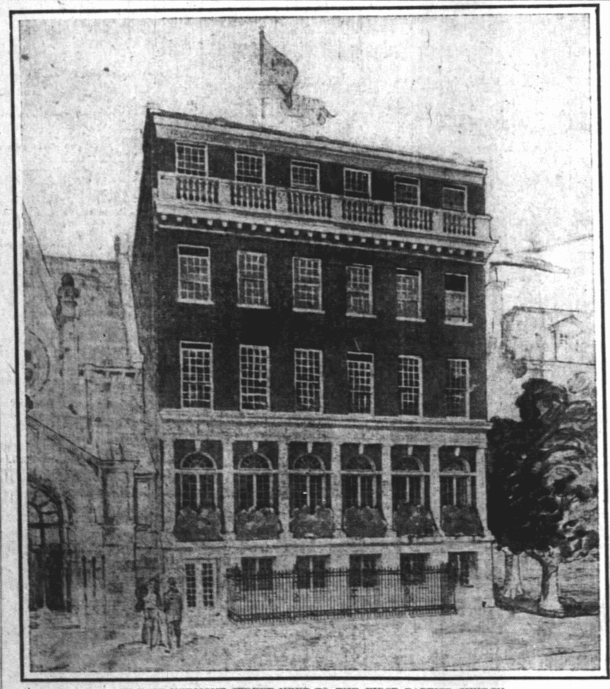 The Bobbs-Merrill building was slated for demolition along with numerous other buildings to make way for the Indiana War Memorial, but someone intervened. Learn about that here. Learn about the other Mansur property, on the northeast corner of Meridian and Vermont streets in Part II.